Baltimore Oriole ( Icterus galbula ) is a rare to uncommon summer resident in the eastern Panhandle and across north central Texas. They are very rare in the Piney Woods section of the state during the breeding season. However, during spring migration (early April through late May), Texas is blessed with thousands of these bright birds as they pass through the eastern half of the state. Low numbers pass through West Texas as well. 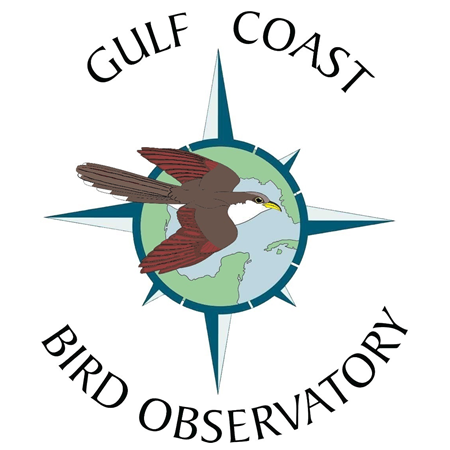 Most of the fall migrants in Texas are found between late July and October. A few Baltimore Orioles winter in Texas each, mostly along the coast. They breed in the eastern United States and parts of Canada where they are present from May through August. They are most often found high in deciduous trees located in open woodland, forest edges, river banks, and small groves of trees. They forage predominately for insects, fruits, and nectar sources. During migration, stake out a patch of Coral Bean along the coast and there will surely be some Orioles present feeding on the nectar. Baltimore Oriole is a member of the Icteridae Family (Meadowlarks, Cowbirds, Grackles, and Orioles). It is one of ten regularly occurring species of oriole in the ABA area. Baltimore Oriole is identified by its boldly colored black and orange body. The male has a black head and upper back and black wings with an orange shoulder patch and a white wing bar. The belly and underparts are a bright orange. The tail is black with orange out tail feathers. The female is similar except the head is dingy black, the wing lacks the orange shoulder patch, and orange on the body is not as bright. They typically weigh 1.2 oz. or 33 grams. Orioles can be quite vocal at times with a song that is a flutelike series of rich, clear, whistled notes. They also have several chattering or scolding calls. The Baltimore Oriole hybridizes extensively with the Bullock's Oriole where their ranges ovelap in the Great Plains. These two species were considered one for a while and called the Northern Oriole, but in the 1990s genetic studies showed they should be considered as separate species. The orioles of the Americas were named after similar-looking birds in the Old World, but the two groups are not closely related. 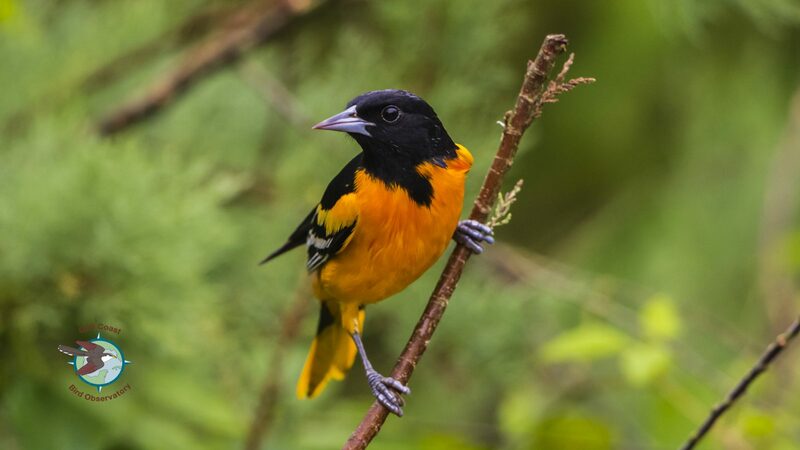 Orioles of the Old World are in the family Oriolidae, whereas American orioles are in the same family as blackbirds and meadowlarks. Both New and Old World orioles are brightly colored with red, yellow, and black; have long tails and long pointed bills; build hanging, woven nests; and prefer tall trees around open areas. Baltimore Oriole gets its name from the bold orange-and-black plumage: they sport the same colors as the heraldic crest of England’s Baltimore family (who also gave their name to Maryland’s largest city). It is the state bird of Maryland and the baseball team, Baltimore Orioles, is named after this bird. Baltimore Orioles sometimes use their slender beaks to feed in an unusual way, called “gaping”. They stab the closed bill into soft fruits and then open their mouths to cut a juicy swath from which they drink with their brushy-tipped tongues. The oldest recorded Baltimore Oriole was over 12 years old when it was caught and killed by a raptor in Minnesota. A group of orioles are collectively known as a “pitch” and a “split” of orioles.